There are four whom we watch. The first is the surgeon, forced to put aside healing to become a soldier in the most brutal war of our time. The second is the assassin, a murderer who weeps as he kills. The third is the liar, a young woman who wears a scholar’s mantle over the heart of a thief. The last is the highprince, a warlord whose eyes have opened to the past as his thirst for battle wanes. So. Yes. The Way of Kings. It's meaty. As well it should be: it’s 1001 pages before the end notes — that includes gorgeous illustrations — and I’m more than a little curious as to how Tor is going to manage to repackage this behemoth into a mass market paperback. 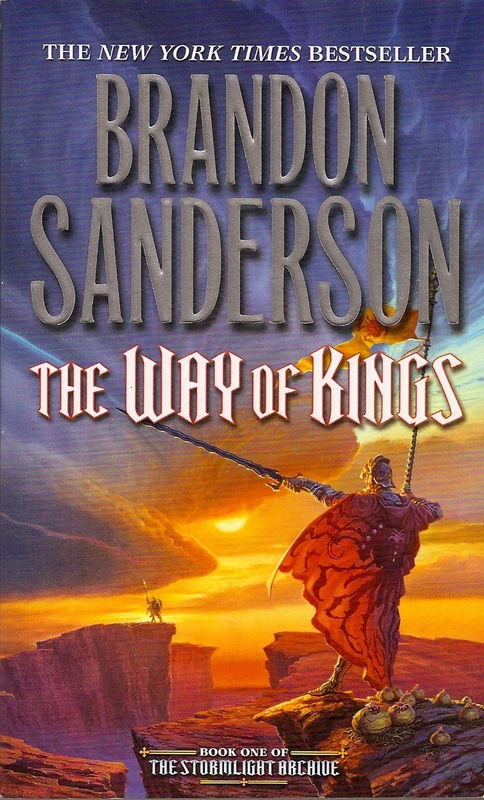 In the first installment of this ambitious series, Sanderson has believably created a world where the violent weather has shaped its geography, its inhabitants (including its creatures), its cultures and the way they create war with each other. As a regular listener of Sanderson’s joint project podcast, Writing Excuses, I’m well aware that he is known as an outline writer — a planner. This habit reassures me, especially regarding the scope of this series. This meticulous planning doesn’t only project to his plot and character arcs, but his worldbuilding as well. A few years ago, I became a little beleaguered of the fantasy genre as a whole, and I think it was because of the lack of thorough worldbuilding I had encountered in new reads at the time. Okay, yes, I’ll admit it: when I begin reading fantasy, my brain opens a little file of 'what’s different?' in the novel’s setting. What are the defining aspects of the cultures? What sets the world apart from our own (aside from the presence of magic)? And sometimes? Sometimes I’m a fantasy snob. Yep. It's true. If the worldbuilding is done poorly, if it feels slapdash and 'just to be different’ instead of traits embedded within the culture through evolving traditions, it’s a big mark against the author, in my mind. So, when I read in The Way of Kings that the high society of the Alethi culture (Damn it! My anti-spoiler alarm is kicking in. Annoying thing!) do something in particular for propriety's sake, I crossed my fingers that the reasoning would be traced through the history of the people; that there would be a reason more than simply creating a token cultural difference. Well, Sanderson did one better, in my mind — he used this cultural oddity in the narrative! No spoilers, but the peculiarity came up in the plot, and worked, oh, so well. I was silently cheering him on. I’m also hoping the reasoning behind this cultural oddity will be revealed in a later work (with nine books forthcoming in the series, I figure he’s got a lot of opportunity to do so. Ha!). Sanderson has talent for skillfully rendering intense, battle-ridden scenes. With the unique geography, there is fascinating strategy and setup to the tactics, like nothing I’ve encountered before. Enough so that it flipped something I don’t usually pay too much attention to (battles and war — gasp! ), into an interesting element of the narrative. The straightforward day-to-day technicalities of running a war camp in this unique geography lend reality to the strife and internal struggle of Kaladin, one of the central characters. And can I just say it’s extremely satisfying to read parallel story lines and discover they artfully dovetail together? It's one of my favourite things, as a reader — the inevitable yet unexpected, and how two analogous plot arcs collide. There's that Sanderson planning for you. Now, there were some nagging questions (see above, re: basis for cultural oddity in Alethi society), and while some of the questions plaguing me during my read were eventually answered, mostly it was while creating more questions to tantalize and whet the appetite for the next book. As meaty as The Way of Kings may be, it’s truly setting the groundwork for an epic series, introducing a world cracked and ready to be remade, for good or bad. There is enough meat here that the ambitious projection of another nine books in the series doesn’t feel quite 'ambitious' so much as 'completely necessary' by the end of this tome. Sanderson has created a world in the middle of astronomical change, and has a handful of pivotal characters on standby ready to shape that change. If you’re a fantasy fan wanting a story that you can sink your teeth into, The Way of Kings has all you’re looking for: unique worldbuilding, interesting magic systems, classic battle clashes, and believable, noble characters, and humour, too. Enjoy! 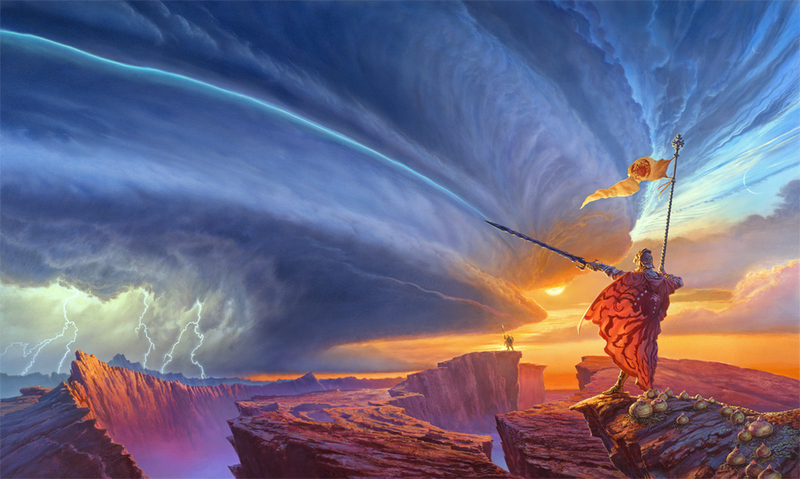 ETA: It also has some amazing artwork by Michael Whelan. Breathtaking.